As we saw earlier that the iPad is a tablet computer products made ​​by Apple Inc. (AI). 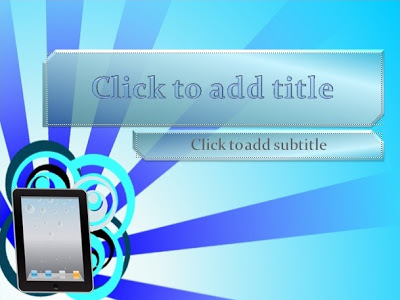 iPad has a form view that is almost similar to the iPod Touch and iPhone, only it was bigger than both of these products and have additional functions such as the one on the operating system Mac OS X. For users and fans iPad tablet computer, maybe this powerpoint theme can be a collection or can simultaneously be applied in presentations related to technology, science, or computer science.